The AdvantageDKE line of keyless entry offers post and surface mount configurations. 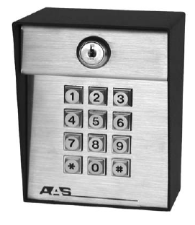 This Advantage DKE post mount digital keypad is stand alone and has a 100 fully programmable, four digit codes. AdvantageDKE post mount digital keypad is housed in heavy metal, powder coated enclosures with stainless steel faceplate, providing years of trouble free use. With a 100 code capacity, the AAS model # 26-100L keypads is the perfect solution for many low cost installations.